Thermoflow is the leading developer of thermal engineering software for the power and cogeneration industries. Since 1987, Thermoflow's software product line has grown to become the most popular, well-proven, and comprehensive system available today. There are two types of heat balance programs: "Application-Specific" and "Fully-Flexible". An Application-Specific program is a special-purpose tool, focusing exclusively on one type of plant. The program includes a vast, general model and the user selects a subset of it via a guided, structured procedure. A Fully-Flexible program is a general-purpose tool, which allows its user to construct any model by connecting appropriate building blocks, in a flexible, unfettered fashion. Each type of program has advantages and limitations. Application-Specific Heat Balance Engineering Software. This line includes Thermoflow’s most popular programs, GT PRO & GT MASTER for gas turbine-based cycles, STEAM PRO & STEAM MASTER for pure steam power plants, and RE-MASTER for repowering existing steam plants by adding gas turbines. 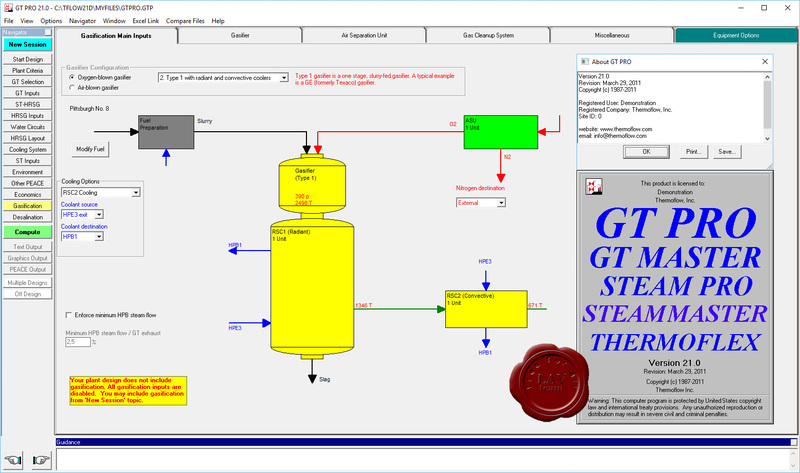 It also includes the Plant Design Expert (PDE) program for executive-level use of GT PRO. Fully-Flexible Heat Balance Engineering Software. THERMOFLEX is a fully flexible program that allows you to model a broad range of thermal systems, with emphasis on power generation and cogeneration. THERMOFLEX can be used to model gas turbine combined cycles, steam power plants, or repowering, in addition to a virtually endless variety of power plant systems, standard or novel. THERMOFLEX provides design and off-design modes into a single program, so you can use one program for all your calculations. THERMOFLEX is an economical alternative for users who have a wide range of application interests, but insufficient activity in any one plant type to justify the cost of the application-specific programs.